US SMG Thompson M1A1, M1, M1928. 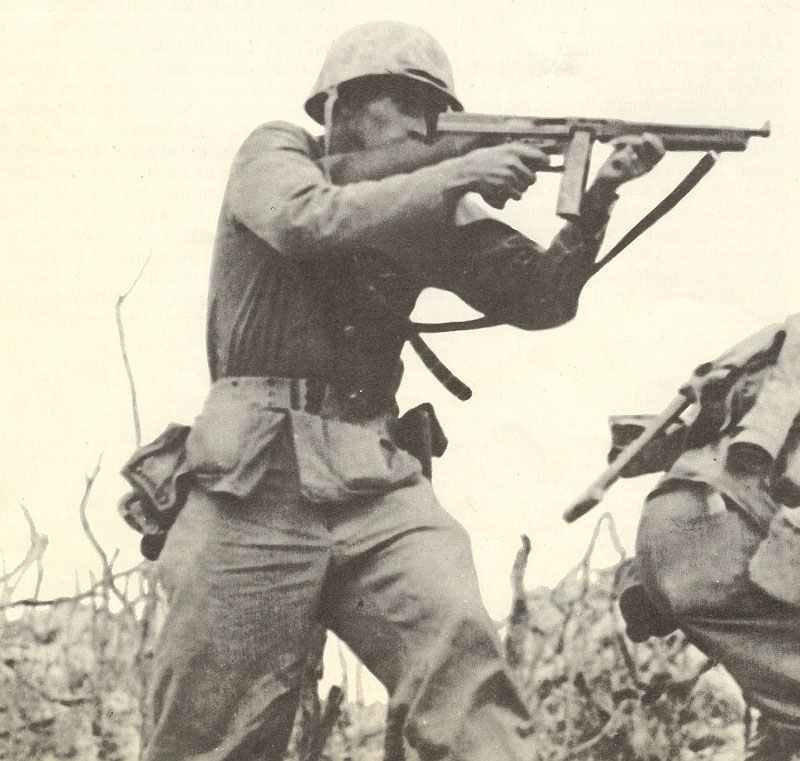 A Marines is aiming with his Thompson submachine gun on a Japanese sniper during the battle on Okinawa. The Auto-Ordnance Corporation was founded in America in 1916 with the intention of developing a variety of weapons; they may well have done so, but only one has survived, the Thompson submachine gun. Named for General John T. Thompson, the company’s design director, the first models were built-in prototype form in 1919. The first production models appeared in 1921 and from then on manufacture was small but continuous through­out the 1920s and 1930s. The first official military recognition came when the United States Marine Corps were issued with a number of the 1927 model, which were officially named the Thompson M1928. The Thompson submachine gun is rather different from most other submachine guns in that it uses a delaying system in the action, to hold the bolt closed for a fraction of time while the cartridge clears the barrel. This was achieved by a device called the ‘H-piece’, from its shape, which served to lock the bolt to the receiver at the moment of firing. The H-piece was set at a carefully calculated angle, and the inventor claimed that this angle was so critical that when the maximum pressure of the explosion pressed against it, the result was to lock bolt and receiver securely together. Then, as the pressure dropped, the friction of the inclined faces lessened until the H-piece was able to slide and so unlocked the bolt. This system, known as the ‘Blish system’ from its inventor, was accepted as the gospel when the gun was first introduced, because a breach lock seemed to be a logical thing on any gun. But with more experience of submachine guns as time went on, the effect and desirability of this locking system began to be questioned. Eventually some experimentation showed that the removal of the H-piece made no difference to the functioning of the gun, except to increase the rate of fire. In 1939 the Thompson was the only sub-machine gun in production outside Europe, and as a result the government of Britain, France and Sweden hurriedly placed orders. Shortly afterwards the US Army also ordered a large quantity. But the Thompson was a difficult gun to manufacture; the engineering processes were numerous and complicated and the materials used were of the best quality, a fact which was reflected in the price-almost £50 (~ 240$, a price for which it was possible to become nearly nine German MP40). By the end of 1940 orders for over 318,000 guns had been placed; previous production had been by the Colt Company under licence from the Auto-Ordnance Corporation, but now Auto-Ordnance built their own factory and by late summer of 1941 were producing guns. The Savage Arms Co. were also given a licence to manufacture, and between these two plants over one and quarter million Thompson guns were produced during the war. British troops in training, using original ThompsonM1928 submachine guns and wearing the standard gas-mask which never saw action. GI aiming with Thompson sub-machine gun. The Tommy gun in Burma. French Commandos armed with Thompson sub-machine guns return to their own country at last. 3d model of Thompson M1. In order to make production easier the gun was re-designed in 1941; the H-piece was discarded and the weapon became a simple blow-back gun. The facility of using a drum magazine was also discarded and a 30-round box became the standard. Various other simplifications were made, notably the abandonment of the carefully made front grip and its replacement by a simple wooden fore-end, and the resulting weapon was standardized by the US Army as the Thompson M1 submachine gun in April 1942. This was later modified into the Thompson M1A1 by making the firing pin integral with the bolt, and dispensing with the hammer. The Thompson had a lot of drawbacks; it was difficult to make; it was expensive, even in its simplified form; it was heavy. But for all that, it had one great virtue in the eyes of soldiers – it was reliable. Trouble with a Thompson was a rare event, provided it was properly cared for. It was a favorite weapon with British Commandos and US Rangers throughout the war and for many years afterwards. One remarkable thing is that in spite of the complication of the H-piece locking system, the Chinese were sufficiently impressed with it to manufacture their own copies (without benefit of licence) as early as 1930 and all through WW2. Manufactures Auto-Ordnance Co., Savage Arms Co., Colts Patent Firearms Co.